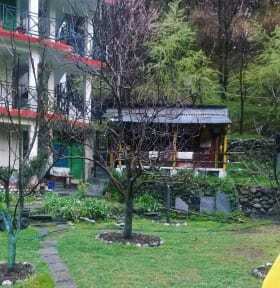 Best hostel in Manali for sure. Best place to stay in whole Himachal I think. Starting from the hosts - Abdullah and Jagriti, these people are awesome in every aspect. From setting up bone fire to live grilled food for us. They took upon themselves to make it a trip for us. Everything prepared in the kitchen is from organic stuff including the salt too ( rocksalt) . The food was great Everytime, served hot with good sides and desserts. Very beautiful, calming and isolated place. Lot more to write! Please give more characters! I stayed at this hostel a few nights and really enjoyed it. It is about a 20 min hike and the location is absolutely beautiful. It’s away from the city so you don’t get a lot of honking sounds, just the background noise of the waterfall. It’s also still close to Old Manali and all the shops and cafes. Would recommend! 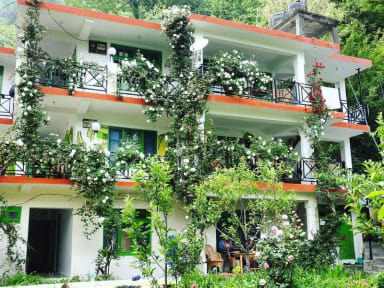 Rockway is a wonderfully located hostel amidst lush green forest and much to my surprise, just by the river. It offers a spectacular view of the mountains that surround it. Considering that they are reasonably priced and have left no stone unturned in satiating my appetite with scrumptious home cooked meals during my stay,without a doubt,I shall visit again. The bathrooms are clean and linen,fresh.Staff is friendly. Away from the hustling town, yet not too far to venture out. Highly recommended! Rockway was a bliss.Beautifully hidden behind the sparkling green tree after the rains when I first saw it, I was certain this was the exact place I was looking for. Had a lovely time there.The staff was friendly and we use to chill there almost every night. I had booked for 1 day and ended up staying in this gem for 2 more nights.i am surely going to be back.if you are looking to relax and have fun at the same time,this is it. This is the hostel to go if you are looking for "ME Time" and silence ,only noise is of river flowing near by the hostel that's how I would Sum it. Reaching the hostel requires a hike of about 500 meter, which could be tricky in nights as there is no light on the way through. The guy at the property abdulla is a nice and welcoming person. Since the hostel was reopened after a while we didn't have much of services on offer that was kind of downside of my stay. We booked a private ensuite and the owner changed the sheets and that was about it. The floor was filthy, the bathroom was disgusting and looked like it hadn’t been cleaned in weeks. The hot water didn’t work so we had to use the other bathroom where the light didn’t work, so had to use my phone torch. At least they had cute dogs there..